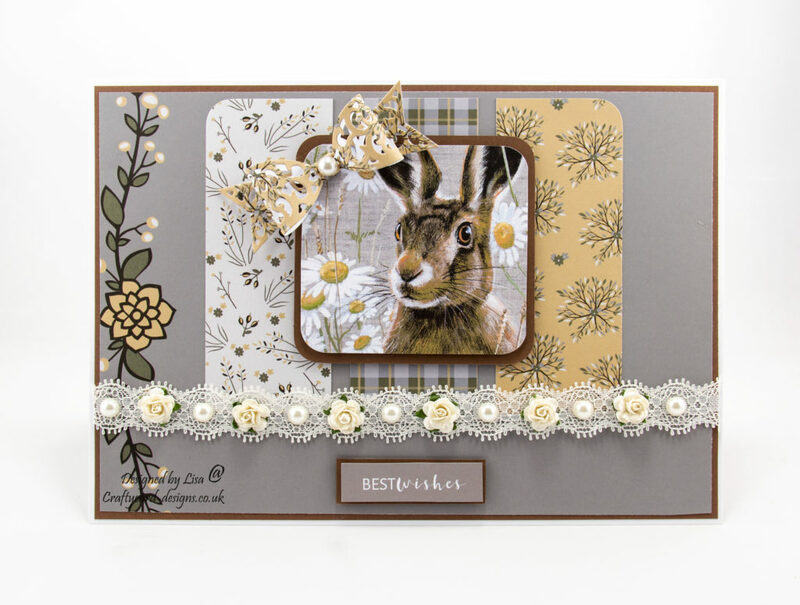 Today’s handmade card has been created using the new dvd-rom from Creative Crafting World called British Wildlife Volume III. With images from Pollyanna Pickering. This will be showing on Create and Craft on the 27th January 2019. 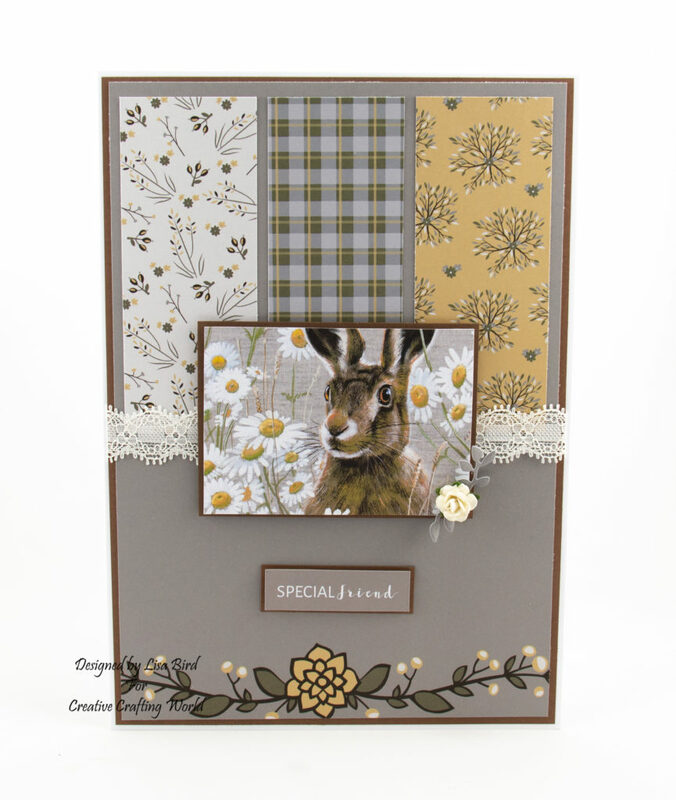 I have used the hare collection for this card. From the dvd-rom go to page one and print off image sheet two. Cut out one of the toppers and a sentiment from the image sheet. From the dvd-rom go to page four and print off papers three, four and five. From the dvd-rom go to page five and print off paper one. Cut a piece from chocolate card measuring 25 cms by 17.3 cms. Using paper one cut a piece measuring 24.5 cms by 16.8 cms, leaving one the flower decorations. Next using paper three, four and five cut a piece from each measuring 12.5 cms by 5 cms. Attach these to the last matt and layer at the top, leaving a small border around each (please see picture). Add the cream lace slightly over lapping the smaller layers then attach to the card base. Cut a piece from chocolate card measuring 10.5 cms by 7.5 cms. Matt and layer this with the topper using foam pads. Attach to the card base slightly over lapping the cream lace. Using chocolate card cut a matt layer for the sentiment. Attach this to the card base under the topper. Next using the small leaf die cut two out of paper one. Attach these to the corner of the topper with a single cream ribbon rose. To finish the card go to inserts on the front of the dvd-rom and print a 7″ by 10″ insert and attach to the inside of the card base. Remember with these inserts you can add your own message before printing. After making this card I decided to cut out all the pieces of card and papers again to make a different card design using the same matts and layers. From the dvd-rom got to page five and print off paper one. Attach these to the last matt and layer at the top, leaving a small border around each. As you can see from the above picture the main layer has been turn horizontal (please see picture). Cut a piece from chocolate card measuring 9.5 cms by 9.5 cms. Attach to the card base over lapping the three paper layers. Next attach cream ribbon roses and cream pearls to the cream lace. Using the bow die cut a bow out in paper five and attach to the top of the topper with a cream pearl in the centre. Two really gorgeous cards, I’ll be looking out for that CD. Thank you for sharing at CD Sundays. Two beautiful cards and beautiful images. I won’t be here when the show goes out but I will look for this CD when I get home. Both beautiful cards Lisa. I can’t decide which is my favourite of the two. Great designs. 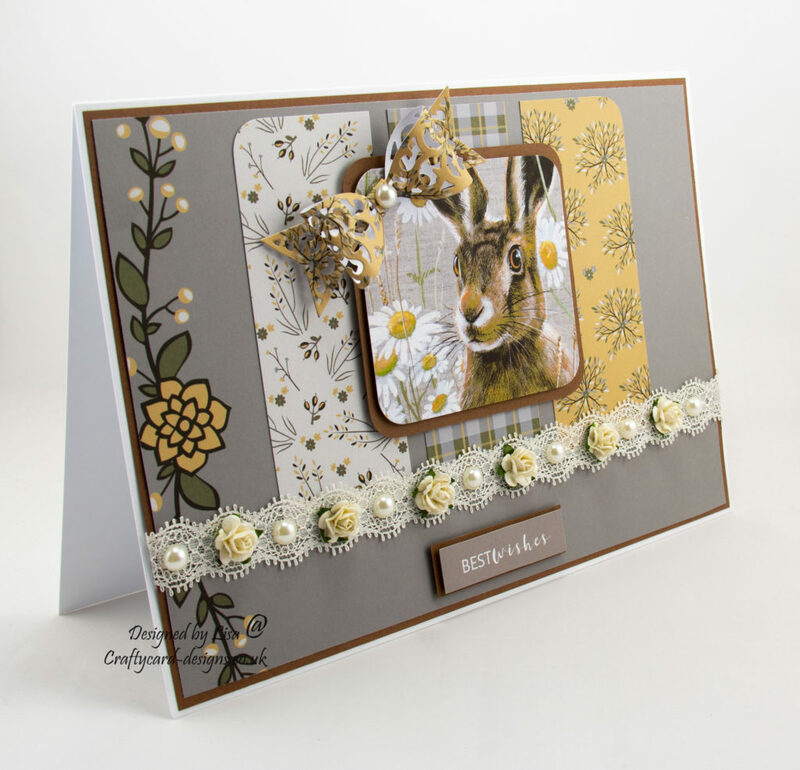 Beautiful creations, love the image and designs! Thank you for sharing with us over at The Creative Crafters. We hope to see you again.